As promised here is my second entry for this year’s Silent Auction that is being promoted by Explorers Against Extinction. 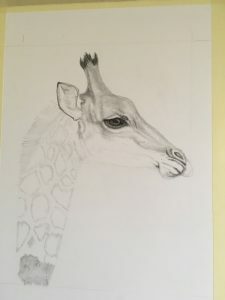 She is a young Southern African Giraffe and is also in graphite pencil. This is very much a work in progress as I can only work for a very short time due to having injured the tendons around my right shoulder. The drawing is A4 and I am incorporating some of the techniques I learned from my time spent with Jamie Boots, a fabulous graphite artist. For reference I am using with permission a gorgeous photograph taken by Fiona MacKay Photograph during one of her many trips to Africa.